kinetic-scrolling bool r/w/en Kinetic scrolling mode. window-placement Gtk.CornerType r/w/en Where the contents are located with respect to the scrollbars. edge-overshot The ::edge-overshot signal is emitted whenever user initiated scrolling makes the scrolled window firmly surpass (i.e. edge-reached The ::edge-reached signal is emitted whenever user-initiated scrolling makes the scrolled window exactly reach the lower or upper limits defined by the adjustment in that orientation. move-focus-out The ::move-focus-out signal is a keybinding signal which gets emitted when focus is moved away from the scrolled window by a keybinding. scroll-child The ::scroll-child signal is a keybinding signal which gets emitted when a keybinding that scrolls is pressed. Gtk.ScrolledWindow is a container that accepts a single child widget, makes that child scrollable using either internally added scrollbars or externally associated adjustments, and optionally draws a frame around the child. Widgets with native scrolling support, i.e. those whose classes implement the Gtk.Scrollable interface, are added directly. For other types of widget, the class Gtk.Viewport acts as an adaptor, giving scrollability to other widgets. Gtk.ScrolledWindow’s implementation of Gtk.Container.add() intelligently accounts for whether or not the added child is a Gtk.Scrollable. If it isn’t, Gtk.ScrolledWindow wraps the child in a Gtk.Viewport and adds that for you. Therefore, you can just add any child widget and not worry about the details. Unless Gtk.ScrolledWindow :policy is Gtk.PolicyType.NEVER or Gtk.PolicyType.EXTERNAL, Gtk.ScrolledWindow adds internal Gtk.Scrollbar widgets around its child. The scroll position of the child, and if applicable the scrollbars, is controlled by the Gtk.ScrolledWindow :hadjustment and Gtk.ScrolledWindow :vadjustment that are associated with the Gtk.ScrolledWindow. See the docs on Gtk.Scrollbar for the details, but note that the “step_increment” and “page_increment” fields are only effective if the policy causes scrollbars to be present. If a Gtk.ScrolledWindow doesn’t behave quite as you would like, or doesn’t have exactly the right layout, it’s very possible to set up your own scrolling with Gtk.Scrollbar and for example a Gtk.Grid. Gtk.ScrolledWindow has built-in support for touch devices. When a touchscreen is used, swiping will move the scrolled window, and will expose ‘kinetic’ behavior. This can be turned off with the Gtk.ScrolledWindow :kinetic-scrolling property if it is undesired. Gtk.ScrolledWindow also displays visual ‘overshoot’ indication when the content is pulled beyond the end, and this situation can be captured with the Gtk.ScrolledWindow ::edge-overshot signal. If no mouse device is present, the scrollbars will overlayed as narrow, auto-hiding indicators over the content. 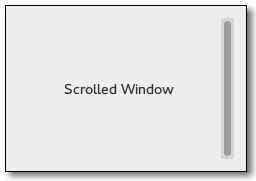 If traditional scrollbars are desired although no mouse is present, this behaviour can be turned off with the Gtk.ScrolledWindow :overlay-scrolling property. Gtk.ScrolledWindow has a main CSS node with name scrolledwindow. Gtk.ScrolledWindow also sets the positional style classes (.left, .right, .top, .bottom) and style classes related to overlay scrolling (.overlay-indicator, .dragging, .hovering) on its scrollbars. The two arguments are the scrolled window’s adjustments; these will be shared with the scrollbars and the child widget to keep the bars in sync with the child. Usually you want to pass None for the adjustments, which will cause the scrolled window to create them for you. Used to add children without native scrolling capabilities. This is simply a convenience function; it is equivalent to adding the unscrollable child to a viewport, then adding the viewport to the scrolled window. If a child has native scrolling, use Gtk.Container.add() instead of this function. The viewport scrolls the child by moving its Gdk.Window, and takes the size of the child to be the size of its toplevel Gdk.Window. This will be very wrong for most widgets that support native scrolling; for example, if you add a widget such as Gtk.TreeView with a viewport, the whole widget will scroll, including the column headings. Thus, widgets with native scrolling support should not be used with the Gtk.Viewport proxy. A widget supports scrolling natively if it implements the Gtk.Scrollable interface. Deprecated since version 3.8: Gtk.Container.add() will automatically add a Gtk.Viewport if the child doesn’t implement Gtk.Scrollable. Return whether button presses are captured during kinetic scrolling. See Gtk.ScrolledWindow.set_capture_button_press(). Returns the horizontal scrollbar of self . Gets the minimal content height of self , or -1 if not set. Gets the minimum content width of self , or -1 if not set. See also Gtk.ScrolledWindow.set_placement() and Gtk.ScrolledWindow.unset_placement(). Gets the placement of the contents with respect to the scrollbars for the scrolled window. See Gtk.ScrolledWindow.set_placement(). Retrieves the current policy values for the horizontal and vertical scrollbars. See Gtk.ScrolledWindow.set_policy(). Gets the shadow type of the scrolled window. See Gtk.ScrolledWindow.set_shadow_type(). Returns the vertical scrollbar of self . Changes the behaviour of self with regard to the initial event that possibly starts kinetic scrolling. When capture_button_press is set to True, the event is captured by the scrolled window, and then later replayed if it is meant to go to the child widget. This should be enabled if any child widgets perform non-reversible actions on Gtk.Widget ::button-press-event. If they don’t, and handle additionally handle Gtk.Widget ::grab-broken-event, it might be better to set capture_button_press to False. Sets the Gtk.Adjustment for the horizontal scrollbar. Turns kinetic scrolling on or off. Kinetic scrolling only applies to devices with source Gdk.InputSource.TOUCHSCREEN. Sets the maximum height that self should keep visible. The self will grow up to this height before it starts scrolling the content. It is a programming error to set the maximum content height to a value smaller than Gtk.ScrolledWindow :min-content-height. Sets the maximum width that self should keep visible. The self will grow up to this width before it starts scrolling the content. It is a programming error to set the maximum content width to a value smaller than Gtk.ScrolledWindow :min-content-width. Sets the minimum height that self should keep visible. Note that this can and (usually will) be smaller than the minimum size of the content. It is a programming error to set the minimum content height to a value greater than Gtk.ScrolledWindow :max-content-height. Sets the minimum width that self should keep visible. Note that this can and (usually will) be smaller than the minimum size of the content. It is a programming error to set the minimum content width to a value greater than Gtk.ScrolledWindow :max-content-width. The default is Gtk.CornerType.TOP_LEFT, meaning the child is in the top left, with the scrollbars underneath and to the right. Other values in Gtk.CornerType are Gtk.CornerType.TOP_RIGHT, Gtk.CornerType.BOTTOM_LEFT, and Gtk.CornerType.BOTTOM_RIGHT. See also Gtk.ScrolledWindow.get_placement() and Gtk.ScrolledWindow.unset_placement(). The policy determines when the scrollbar should appear; it is a value from the Gtk.PolicyType enumeration. If Gtk.PolicyType.ALWAYS, the scrollbar is always present; if Gtk.PolicyType.NEVER, the scrollbar is never present; if Gtk.PolicyType.AUTOMATIC, the scrollbar is present only if needed (that is, if the slider part of the bar would be smaller than the trough — the display is larger than the page size). Changes the type of shadow drawn around the contents of self . Sets the Gtk.Adjustment for the vertical scrollbar. Unsets the placement of the contents with respect to the scrollbars for the scrolled window. If no window placement is set for a scrolled window, it defaults to Gtk.CornerType.TOP_LEFT. See also Gtk.ScrolledWindow.set_placement() and Gtk.ScrolledWindow.get_placement(). A similar behavior without edge resistance is provided by the Gtk.ScrolledWindow ::edge-reached signal. A similar behavior with edge resistance is provided by the Gtk.ScrolledWindow ::edge-overshot signal. The ::move-focus-out signal is a keybinding signal which gets emitted when focus is moved away from the scrolled window by a keybinding. The Gtk.Widget ::move-focus signal is emitted with direction_type on this scrolled window’s toplevel parent in the container hierarchy. The default bindings for this signal are Ctrl + Tab to move forward and Ctrl + Shift + Tab to move backward. Whether kinetic scrolling is enabled or not. Kinetic scrolling only applies to devices with source Gdk.InputSource.TOUCHSCREEN. Whether “window-placement” should be used to determine the location of the contents with respect to the scrollbars. Deprecated since version 3.10: This value is ignored and Gtk.ScrolledWindow :window-placement value is always honored.